Here they are at Shimon Peres’s 90th: Bill Clinton live and Peres via his text. Take both in small doses. Clinton’s video is short and Peres’s text is too. I still find it difficult getting through them. The narcissism is overwhelming. Granted, we’re all self-involved. But when we go over the line, there’s a problem. As I listened to Clinton and read Peres, I asked myself where their narcissism comes from. I’ve decided it comes from somewhere else. If “somewhere else” sounds elusive, I understand. I’m trying to wrap my mind around why they drive me up the wall. Is it narcissism plus innocence that makes it so difficult? After all, we’re dealing with intelligent people. The worst case scenario is that Clinton and Peres are being disingenuous – like Samantha Power. They’re doing whatever floats their boat. With Power it’s obvious. She’s on her knees but knows better. Clinton and Peres know better, too. Yet with them, I have a sense that they believe their story. Perhaps that’s the difference between a wannabe politician like Power and true politicians like Clinton and Peres. She doesn’t believe. They do. That’s why I cut real politicians some slack. Politics is like show business. Negotiating real life and acting is complicated. Sometimes you take your character home with you. Here we have it – the Holocaust, the price paid for the creation of Israel, the ingathering of exiles, democracy and diversity, hi-tech and the desert blooming. More or less, this is the Jewish understanding of Israel. How much is real? How much is fiction? When the curtain goes up, the distinctions don’t matter much. Since Peres has been there from the creation of the state of Israel and been involved in many decisions, if anyone knows the truth, Peres does. Does he? Now add Barbara Streisand and her honorary doctorate at Hebrew University. Though the media latched on to Streisand’s thoughts about how poorly women are treated in Israel by the ultra-Orthodox, they missed her hope for the future of Jewish-Palestinian relations. It’s a doozy. I love her model “Arabs” walking the hallways. Is Streisand waxing nostalgic about her high school years in Brooklyn? It seems you have to come from somewhere else – Hope, Arkansas, Wiszniew, Poland or Brooklyn, New York – to speak eloquently (and innocently) on behalf of Israel these days. Coming from somewhere else. That might be another angle on the narcissism problem. Are Jews always coming from somewhere else even when they’ve ostensibly returned home? Don’t assume anything about posterity. Empires die and this one will too. they didn’t die for Zionism . It was not according to Kastner. What an ingrate. Not even a passing mention of Uncle Sucker’s $3B/year?? I guess Perez’s parent’s didn’t teach him basic manners. Same old crap, over and over; doesn’t make it right. Peres is born in Poland, enjoying to live in Palestine while many Palestininas born in Palestine with roots here going back for tens of generations do not have the right to live in Palestine. And those who are here are prisoners of colonialist zionists. When did thievery, deception, murder, and criminality become Jewish values??? Judaism is much greater than that, a peaceful and forgiving religion. Sadly, Zionism has hijacked and destroyed the true meaning of Judaism. 1S1P1V is the only feasible and STABLE dream, which will soon become a reality. “Judaism is much greater than that, a peaceful and forgiving religion”. You think so? Why? Where is that practised consistently in the Tanakh? “Sadly, Zionism has hijacked and destroyed the true meaning of Judaism”. You surely got that right. Whatever Zionism touches, it misuses and it abuses, it mars and it mutilates. I’ve seen so many thousands of statements like this and even worse, even more narcissistic and delusional in the sense of their thinking they are some ‘special force among mankind, have achieved what no other humans ever have. Probably not worth even commenting on any more..they are what they are….they aren’t going to change or reform themselves. But what we and the world should do this time is vow to make these ‘leaders” , not innocent bystanders, pay for everything they have caused. I find this lying hypocrite more contemptible than even Lieberman who at least tells it as it is. Peres is a war criminal under whose watch tens of thousands of illegal squats were built. Too bad he wont live long enough to stand trial. I think he knows the game is up. That has to be far worse than any war crimes trial could be – knowing they completely f–ked up and Israel is destined for oblivion as a result. Zionist propagandists such as Szymon Perski (the birth name of Shimon Peres) and Bill Clinton are indeed absolutely shameless liars and propagandists. Individuals like these (who aren’t idiots, as much as they try to act like it!) don’t have the “out” of being uneducated propagandists, as they should (and I’m sure do) know better than the lies, debunked propaganda (aka hasbara), and total falsehoods they continue to spew and regurgitate. We turned a refusing land into an inspiring oasis. An absolute lie. The Northern Israel coastal plain is part of what is known as the Mediterranean climate. It is an geographic designation that describes a subtropical region that has very wet winters and dry summers. In the Mediterranean region it includes today’s Northern Israel coastal region and extends north to Turkey (along the coast), to Greece, Italy, Southern France and Eastern Spain. It is not an accident that those are regions that human civilization first emerged. It happened because those were the most agriculturally productive regions in the old world. This kind of climate is what also exists in today’s NW Iran. Those are our cradle’s of civilization. It is not a coincidence that most of California east of the Sierras consists of a Mediterranean climate. And that is directly related to the fact that California became one of the most wealthy states in the US. So what we have is that the Zionist conquered the northern Israel coastal plain, that had been a productive agricultural region (according to modern archaeology for about 4 thousand years) and claimed they turned a desert into bloom. Total lies. I also note that they claim they drained Malarial infested swamps at the same time. Actually what they did here was to bring in European pumping technology and lowered the Northern Israel coastal plain water table to such an extent that many wet lands along the coast dried up. As has been pointed out by many observers the Israelis used that extra water to irrigate forests planted Northern European pines (some of us must remember those JNF fundraisers about planting a tree in Israel). As we saw with the Carmel fires those pines dry out during the hot summers that define the Mediterranean climate. They burn badly during droughts. That is what the European Zionist colonialist brought to Palestine. So here is question for another time: why did the state of Israel undermine a self sufficient agricultural society? Perhaps few have noticed but all of those wonderful socialist Kibbutzes have turned into real estate speculators. The landscape and nature are not holy unless they are part of a culture of power. Even collective trips belong to the culture of ownership. The antiquity of the land is important only if it is under “our ownership.” What makes that more obvious than turning the graves of sheikhs in the Galilee into the graves of “the prophet Habakkuk,” “Mordechai the Jew,” and all kinds of Talmudic sages who lived and died in Babylon and were buried here merely as part of the spread of this state’s ignorance (which began with the “sanctification” of these graves in the 1950s )? The sanctity of the land means loving the state that is destroying the land. Indeed, one cannot deny the demographic fact that, 100 years ago, 1 million people lived on this swath of land and now, without additional water or natural resources, since these have not been discovered over the years, almost 11 million live here. That is why the greenery is being taken over by concrete. But did they have to destroy the landscape? Well, those who built the state and destroyed the land were always blind to the scenery to which they came. It suffices to compare the minute spaces the state did not dare touch – those owned by Christian churches – to see how beautiful this land is when construction blends in with the landscape. “The Yarkon is also synonymous with environmental pollution of water sources. Unlike the Kishon, the Yarkon suffered mostly from insufficiently treated urban and agricultural wastewater. Because much of the water that used to flow into the Yarkon is now diverted for human use; much of what still enters the river is wastewater. The worse its quality is, the more damage is done to the entire ecosystem of the river, making it impossible to use it for recreational activities. “SPNI is concerned that scrublands and grassy areas are facing the same fate as other natural spots that have shrunk over the last few years, largely due to increased construction and greater infrastructure needs. In the coastal region, most sand dunes have been mined or covered by homes. The limestone cliffs along the shore and the loam of the Sharon region are rapidly disappearing as a result of mining and construction. In the Negev, the loess plains are facing the threat of extinction. Rothschild’s report lists a series of threats the scrublands are facing. A major one is the expansion of cities into open spaces. Expansion plans for cities like Elad and Modi’in directly threaten the Mediterranean scrublands and green hills where gazelles now cavort freely and spring flowers blossom, attracting thousands of visitors. Another threat is the activities at army bases, where many scrublands are located. While there is no danger they will be harmed by home construction on these bases, they can be damaged by the military training on the grounds. During military operations in recent years, there have been huge fires that seriously damaged the open spaces. REGARDING HOPE, ARKANSAS (CIRCA 1966): While Bill Clinton was a student at Georgetown University, he sent a ‘Hope, Arkansas’ postcard* to his grandmother (whom he addressed as “Mammaw”) in a Hope, AR nursing home. 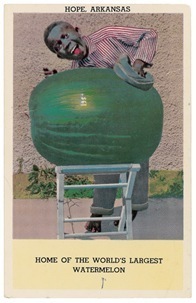 To say the least, it was a ‘racially insensitive’ postcard (showing a barefoot black man “polishing” a watermelon). Kibbutz Alumot: in his time it was a salty failure in the desert. It was abandoned until 1967. Geva: in the Jezreel Valley. Not a desert. Clear, pointed, and another knockout. Love it. You do what you do so well here at Mondoweiss, talknic. Kudos. Feeding time for US Jews…….open wide now and enjoy this delicious hasbara pudding so you can delude yourselves that your true homeland is good for the US and that it is ‘making big contributions’ to America. This piece of propaganda reminds me of how birds regurgitate their stomach contents into the mouths of their hatchlings. Israel contributes to American lives and is gonna restore our global competitiveness? Gee, how did the US ever manage to get by without the Jewish state? More than anyone alive, he’s responsible for the continued colonialization of Palestine after the 67 war. Israeli generals including Rabin and Dayan were not in favor at the time. But Peres wanted it, so the colonialization program was started with his strong push and support. Peres is the ultimate zionist thug with two faces, one that the west and the simpleton Clinton falls for, and the other is the face that all of us Palestinians know and saw. ICC/ICJ should start with Peres. >> We turned a refusing land into an inspiring oasis.